Note to new readers: Message from your Mother is a series of letters written by Lilly to her daughter which are based on their most recent phone call. The letters are often written in the kind of irrational way that seems to come naturally to most mothers when providing advice to their children. You will always find a hidden message though if you look hard enough. I enjoyed our conversation last night about the need for that 'must have' accessory, called confidence. I have been thinking some more about this. I know how you 'love' me giving you advice but you also know how much I love donning my mother cape ...(just humour me a bit). I agree, I think it's sad when people constantly criticise others for no good reason. It took me a long time and a hell of a lot of criticism to realise that the weather is the best teacher of all (besides your grandfather of course) when it comes to understanding how to deal with overly critical types. No, this is going somewhere I promise you. It always does, it’s just that I always seem to take the longest route to get there as you know. But the journey is always scenic, right? Anyway, it’s like this, we cannot change the weather, we just have to accept it because we can't change a thing. Do you think the weather pays any attention to our criticism? No, it just does what it does and keeps on its path. The weather is one incredibly confident atmospheric condition. We need to be as confident on the path we choose to take. People who are overly critical or aggressive often come from a place of total insecurity. We don't associate loud aggressive types with being insecure but they usually are. They often want control over others and the fact is, they should have no more control over others than any of us have over the weather. I've never seen a happy, self confident person being abusive to someone else or putting others down. The two never mix. People with low confidence are not sure about anything. They do not accept they are unique nor do they accept the way they have been made. They want to be someone they are not. They are double-minded, indecisive people who constantly get frustrated with life. And with others. If they do make a decision, they are tormented by self-doubt. They second-guess (and third- and fourth-guess) themselves. As a result, they don't live boldly. They live little, narrow lives, and they miss out on the big, rewarding lives. And they can end up being critical and angry people just wanting to bring others down with them. Unfortunately they are best to avoid or ignore. Truly. So having self confidence is a must-have accessory it's true. Confidence is our fuel and without it you're just like a shiny jet airplane (some of us are jumbos and need more fuel) sitting on the tarmac doing nothing but staring into space. Waiting. Being confident is about living without fear. Being true to who we are. It’s something we all should strive to do every day of our lives. I was trying to find an image which kind of represents what I am trying to say. I found this one. Its abstract I agree, but tell me how confident do you think you would have to be to wear this? It would be like walking down the main street naked, no? So, I think you should keep that bag in mind when thinking about confidence. Confident people are bold, open, willing to share, transparent and classy. They are authentic with a touch of mystery. As your grandmother always says, your handbag holds your life so it's wise to choose a beautiful life. And I'll add to that and say, the most beautiful life of all is a confident one. PS. Do you think this sounds like a plausible reason to buy that new authentic Oroton handbag? I noticed it in their summer catalogue today. When I saw it I immediately thought of one word only, confidence. Followed very closely by a few more words, I just have to have it. No seriously, my message to you is not really about giving myself an excuse to buy a new handbag. I truly did want to give you advice about ignoring critical people.....but....somehow that bag appeals to me even more now.....I like the idea of living boldly.....transparently....being true to who I am...... and I think you just saw straight through me....****!!!! Hi Lilly, interesting reading. What about the Eleanor Roosevelt quote " Nobody makes you feel inferior without your permission " Think it says it all. Mmmm I smell a rat. I think you said all of that just so you could justify buying that confident looking handbag. Yes, you are totally transparent. I am not sure I would have the guts, let alone the confidence, to carry off that handbag. People seeing what I carried in my bag would be distracting I guess. I do not want people pointing and staring at me. Although potential robbers could see what I had without having to rip my arm off and steal my handbag all for nil gains. Maybe I am coming around to the idea after all. I like the quote about people in pain only cause pain because there sure are some mean people in the world. Confidence is a tough one it really is. It is especially hard taking mean criticism from your family or your work colleagues don't you think? From the outisde , looking in, yes, you would be percieved to tbe a confident person, going about your life , with nothing to hide, open to all. But sometimes, it helps to have a opaque little clutch purse inside in which you store the "small change"; stuff thats not earthshatteringly important , but something you want to keep to yourself. This doesnt hurt anyone, and if people ask about it, it gives you training in formulating and answer, depending on how much you want to reveal, without hurting anyone. very wise advice Lilly - I can see Des inspired you to be very confident ...and crafty ! Go buy that bag ! Great post - as usual!!! And yeah, I could dig that bag! Come on over to my blog!!! A Bella good morning video and a GOOD MORNING GIVEAWAY!!!!! Buy the bag. BUY THE BAG!! Great topic, Lilly. Confidence is a tough subject, really makes you think. And I love that bag. Although I'd think first what I put in it! Great post! I feel that way to and due to how I was raised it took me many years to get to the confident place..I would say probably my 40's. I love it, I no longer feel I owe anyone anything, I dont make excuses for being selfish at times and I love taking care of my needs, sometimes before others. My confidence has always at least the last 10 years, gotten me excellent jobs and I dont have a degree. I just believe that much in my ability. YES, you need that handbag...i agree its a show piece..for me it wouldnt work because I'll be honest, there are 2 areas of my life where I'm a 100% slob, 1 is my purse and the other is my car. I should empty my purse and take a couple pictures for my blog--you would be amazed. One time--no lie here, I actually pulled out a couple month old Mcdonald Hamburger still in the wrap! I used to work in a high end retail store, and we had to carry plastic see through handbags. It was freeing. I loved you post. I am new to your blog, I didn't know you were a Mama. Oh I love this post. Very good advise. Even as adults, a good self esteem lesson is always good to hear. About that bag. well, you must be classier on the inside than I am. I could never pull it off. but since you can. GO FOR IT! It's a good post with good advice. And I'm glad you included the P.S. because I've been waiting for another "Message from your Mother" post to recommend a book. It's called "amy's answering machine: messages from mom" bu Amy Borkowsky. It's a fantastically enjoyable read. "Confident people are bold, open, willing to share, transparent and classy." Very well said. That statement will forever stay with me. Oh, and definitely buy the bag. What a wonderful, thought-provoking post. You're right that most people who are pushy and aggressive are insecure, using that pushy/aggressiveness to hide the internal flaws that they don't want people to see. 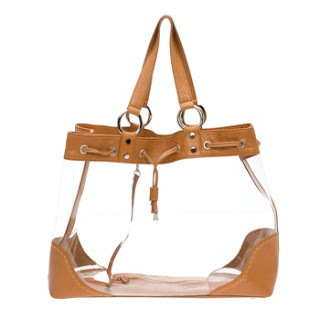 To live transparently, like that delightful handbag, is another extreme, which I'm not sure is such a good idea. Confidence doesn't require being completely transaparent. Honest enough to know what should be shared and private enough to appreciate respect, sounds like a good combination to confidence. Then again, that handbag really IS cool! I enjoy your "Message from you Mother" posts! I wonder if your daughter ever asks after a phone call, "Is this going on the blog?" Great post and great advice, Lilly! And I love the Eleanor Roosevelt quote too. Thanks as always! This is such a beautiful post and so true...every word of it. However, a transparent bag is a bit scary for me. I've been the attempted victim of pickpockets several times when I've traveled. Such good advice, I knew you were a solid Mom, will you adopt me LOL. You say you like to take the long way around. Nothing at all wrong with that. Many times it allows you to see things from many different perspectives. "Confident people are bold, open, willing to share, transparent and classy. They are authentic with a touch of mystery." I'd say you've earned it, go for it Lilly and then fill it up and take a pictre of it so we all can see "what's in Lilly's bag"
Oh... what a great post, it was like you were giving ME a pep talk, not your daughter. I need to read this post 10 times a day. What terrific advice to give your daughter, Lilly. It sounds very Des, to me, if I may say so. But you delivered it to your own daughter in a very "confident" way. I don't know about the hand bag (not my thing, you understand), but what equivalent mens' accessory could/should be made in order for a man to feel more transparent or liberated? A wallet? Not very telling for most men, I'm afraid (unless you would like a peak at how much money men keep in there). No, in my opinion perhaps the most telling "confidence indicator" for men is that frontal baby harness thing you see some men wearing, sort of like a reverse back-pack with a baby strapped in. I have never had occasion to wear such a contraption, but I can't help but think that would require a man to be very confident with himself (unless, of course, his wife MADE him wear it - which puts the whole confidence thing in an entirely different light, doesn't it?). HAH...As soon as I read the part about the purse...I hollered at my sweety who is watching the Jazz game...and Said...sweety...I REALLY NEED A NEW PURSE. I have my eye on a Karen Wilson that I NEEEEED! He ain't buyin into your concept lol. Great post. You do such an amazing job writing! Thank you so much for your visit and your voice in regards to my blog post on jlo's site. I have had a wonderful time reading your posts. I especially like the letter's to your daughter (they sound much like my mom and I :)) Specifically when you preface your "advice" with "knowing how you love when I give advice.... just humor me.... this really is heading somewhere." It is the beauty of the relationship. I have also enjoy the delightful insight of your father. He is a treasure. His stories are both engaging and delightful. I will be placing you on my page and I am thankful you took the time to read and comment on my growing writing joys. Soon I hope you may be pulled over to the "dark" side of Dark chocolate. :) Have a fantastic Friday! Great pearls :)...buy the purse then please post a picture! I smiled when I saw it, I'm not a shoe and purse woman but I work with one, she makes me smile, she'd love this one! That is funny and smart at the same time. You would have to be extremely confident to buy a bag like that I think. I could not handle the stress of keeping a tidy bag. Although, as someone said, it would be freeing. You're so right. By the way, as I've grown older I look back and think how at time --I've gone through the bleak periods of my life, and lacking self confidence haven't been as good as I could. So I think a bit of "self checking" now and then when you feel yourself skittering off to some edge is a good thing. The other thing for your daughter is to give herself credit for all the small things she does well. They may not seem like much, but they add up to a lot. I like to point out to others these things. By the way, thank you for stopping by my fashion blog. I'm glad you liked the post! The handbag you show is pretty cool --though I'd have to buy a new wallet to go with it, and maybe not stuff all my receipts, and assorted gew gaws into the bag! Stopping by to invite you to my giveaway! Being a confident person (that's why I'm so wonderful), I couldn't have said it better myself Lilly. I love these letters ... I have a wee hope that my boys, when older, might read my blog and know me better - somehow. So I have a way to deal with this matter .... I try and remember it is all just feedback. If you ever get a chance to see Terry Hawkins speak - she is an amazing women - the whole feedback thing is her calling card. What a great topic! I agree, the bag is a bit bold--I'm to messy though to allow anyone to see into my bag! I have a family member that, based on your letter, is completely void of confidence. I realize the letter was for your daughter, but after several interactions with my sister-n-law lately, I'm pretty sure you really meant to write this to me!! :) What a great idea to write to your daughter!! I loved this post and the message you gave. The handbag is wonderful. Go get it! I am a handbag and shoe nut. Don't care if I have any clothes as long as I have bags and shoes. "Being confident is about living without fear. Being true to who we are." is is FABULOUS!! i am going to come back and read the rest of your letters!! Loving the photo of the beer drinking Kagaroo. Are those the Wiggles over there in the same pub, eating a vegimite sandwich with the sweet cuddly koala bear? Its funny, when I mention Coach Bags, it really isn't even about a Coach Bag, sometimes, there isn't even a Coach Bad in sight, not literally at least! It's about what the bag represents to me like the hip sassy, richness of the chic girls who know what this latest season's style of Coach even is. Not to be mistaken by the suburban housewife who just bought a knockoff from a street vendor on her latest bus trip to the city... BTW, it, the latest style of Coach is gorgeous! It's got great big fantastic C's all over it, very typographic, you'd love it. I love it, C is my last name in fact. WHOA! I SO digress.... sorry,! So, I was saying about the handbags, I think, see and write and read in hand bag language. I imagine people with labels on their bags, not the Kate Spade labels, that read the Perky, Preppy, Shallow, Etc sort of person who is carrying the bag. I also visualize people's baggage they are carrying around and wonder what labels they would have on their bags. Mine would read: Autism, Motherhood, Lifelong Dieter, Shallow but Deep, Etc. Those are the real labels, but I try to turn my purse over on the other side and show my labels that read Martha Stewart, Flawless, Perfection, Glamourous, Well-Read, Etc. This handbag imagery bounces around in my head a lot. Might write a little post about it someday. My beautiful beautiful Lilly, What an amazing post. You should be writing for a women's magazine. @ Robin - thanks for dropping by. Your words always light up the page and make me smile. No matter what. You are such a force you really are. So glad you came into my life and one day I hope to meet you on your book tour. I will be waiting in line!!!! I learnt a lot from your wisdom. It's amazing the lives we touch and we dont even realise it sometimes. The waves of people you touch just grows and grows. THANK YOU! I've never seen a happy, self confident person being abusive to someone else or putting others down. @ pchi - no a truly confident and self assured person accept themselves and moreso others. People can act confident and big note themselves but you learn to see through the bluff. Thanks for stopping by - much appreciate your comments. As I was reading your advice to your daughter, I thought to myself (very seriously and contemplatively), "Wow! Lilly's full of wisdon. She should be the next Dear Abby." I was digesting every word you had written and then...I busted out laughing, reading your humourous comments at the ending. You are one funny and amazing lady, I tell you. Dearest Lilly ~ Yes I saw right through you...and I could see that you were angling for the latest edition of "The Kylie Report" No need to worry...here goes. I did read in the news that the singing budgie has been slagged off by no other than Sinead O'Connor...surprisingly readers had jumped to Kylie's defence...nothing more than that...except I came across this video on YouTube of Kylie, Sinead and Natalie Umbrugula, which may have started the spat. One thing is evident from the vid'...whatever else they lack (! ), it certainly isn't confidence.